I have recently begun feeling like a coffee after dinner. This has not been a practice of mine for a long time because I’ve lived by the mantra of three coffees a day, and all before noon. However, recently I was offered some at a dinner party and ‘semi’ enjoyed the experience. I say ‘semi’ enjoyed because, without wanting to sound snobbish, it was not only NOT Baristador but it was a particularly cheap and bitter blend. Not one for giving up easily, I have since started experimenting with my B01 and B30 blends after dinner. And guess what, they work! I think the better quality beans, dark roast and low or little caffeine all combine well for a late night coffee. And I’m doubly glad because winter is approaching here in Adelaide and I’m looking forward to a warm beverage that can take the edge off my cravings for dessert! We’ll see how the experiment goes. 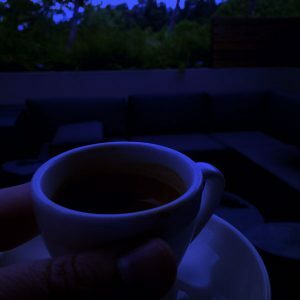 If you have stories about after dinner coffee or reports on using my blends late at night, I’d love to hear from you or have you share them below or on my Facebook Page.